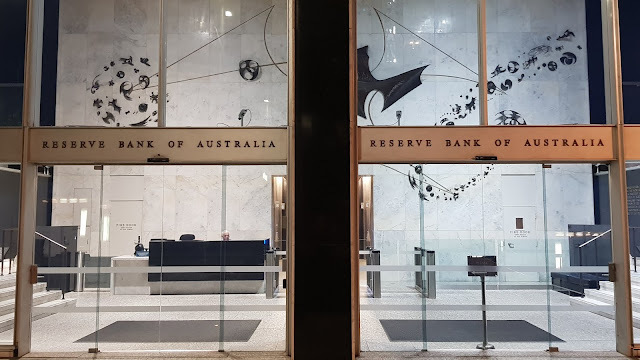 The front entrance and foyer of the heritage listed Reserve Bank of Australia along Martin Place. The Reserve Bank building is a 22 storey office tower bounded by Macquarie Street, Martin Place and Phillip Street. It was designed by F.J.Crocker and built in 1964 in the Post War International architectural style. The foyer wall mural was designed and installed by local artist Bim Hilder. It is made up of many separate small parts of beaten copper and bronze, quartz crystal and semi-precious stones. Pretty! I will look for that next trip. I like the look of the whole place especially with that mural, Jim! I'm going to try and take a photo inside the foyer so there is a better view of the mural, if they allow it. Looks a very impressive foyer. Wow, beaten copper, quartz and semi-precious stones? A lot of trouble to go to for the type of building it is. Lovely. I like that the doors allow a view of the impressive mural. A modern look, and quite inviting!